Todd Babcock, the chairman of the Mason and Dixon Line Preservation Partnership, drives the commemorative iron spike into Stargazer Road. 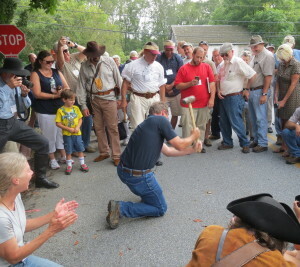 Ken Burns and Steven Spielberg missed out, but hundreds of others did not, traveling from as far away as England and Australia to participate in a notable commemoration in Newlin Township on Thursday. “They should have been here,” said historic preservationist Linda Kaat of the filmmakers. “This was made for the big screen,” she explained, referring to the saga of the Mason-Dixon Line, a locally-rooted tale teeming with the trappings of Hollywood: politics, war, religion, science, even royalty. The story of how astronomer Charles Mason and surveyor Jeremiah Dixon arrived in the New World and proceeded to end a bloody, 80-year boundary dispute between Pennsylvania and Maryland – considered one of the greatest scientific achievements of the time – is attracting new attention as the 250th anniversary approaches. Chas Langelan, vice chairman of SHS and one of the surveying event’s organizers, shows off the plaque that was unveiled on Thursday next to Harlan House in Newlin Township. On Thursday, the Newlin Township ground where Mason and Dixon trekked from their temporary quarters at Harlan House, a residence that still stands at the corner of Embreeville and Stargazer Roads, to the observatory they established nearby, took center stage. 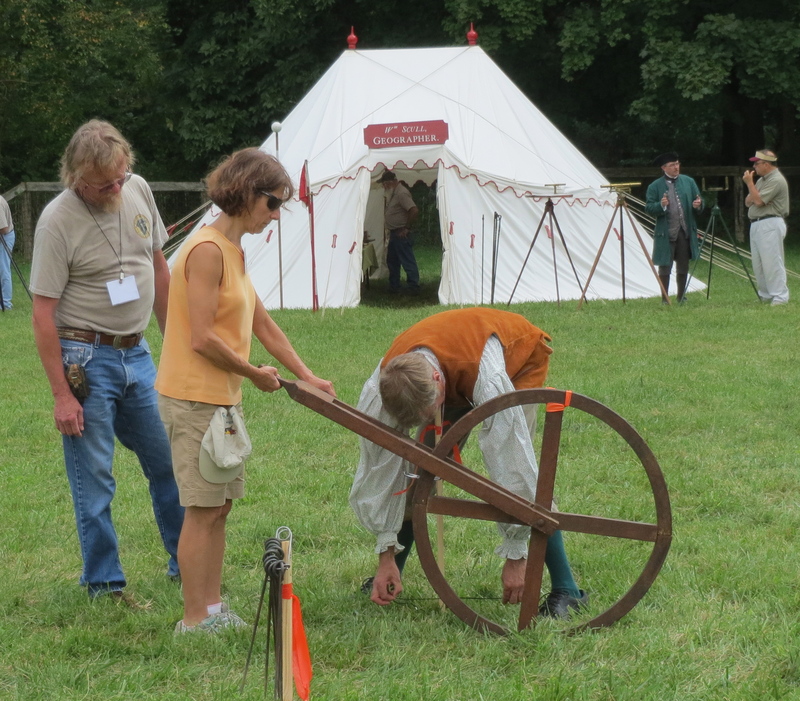 It was one of the gathering spots for the 17th National Rendezvous, an annual event hosted by the Surveyors Historical Society (SHS). The four-day surveying extravaganza, which spotlighted Mason and Dixon this year, also involved Philadelphia-based activities, since the duo began their expedition there. But the pair did the bulk of their calculations in close proximity to the forks of the Brandywine Creek in Embreeville, prompting a daylong program in Newlin. The celebration of history, attended by Rendezvous participants as well as interested members of the public, drew people for a variety of reasons. Newlin Township Supervisors’ Chair Janie Baird said she was pleased the site is finally getting the recognition it deserves. 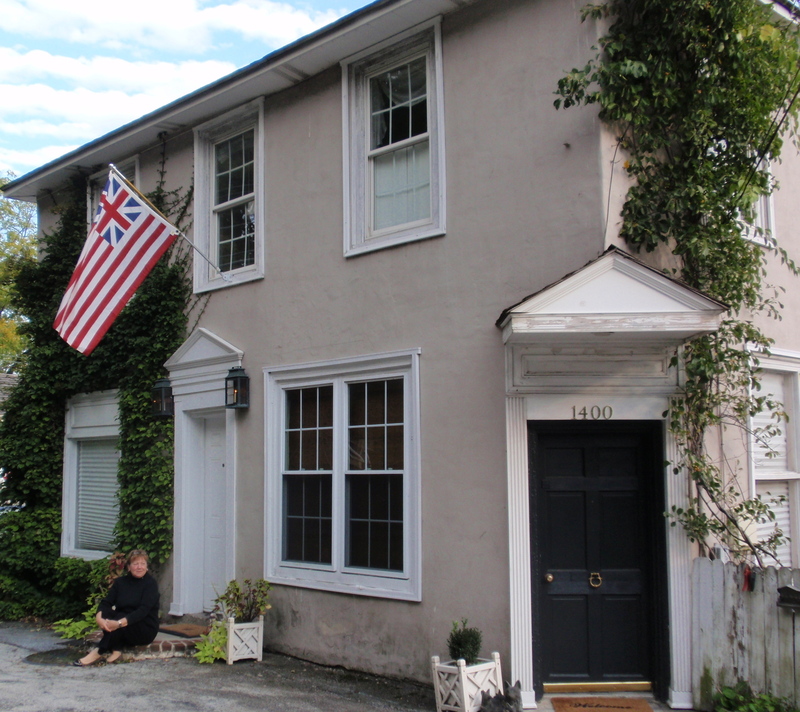 She credited Kaat with approaching the township when nearby land to the Star Gazers’ Stone, a reference point for Mason and Dixon listed on the National Register of Historic Places, went up for sale so it could also be protected. 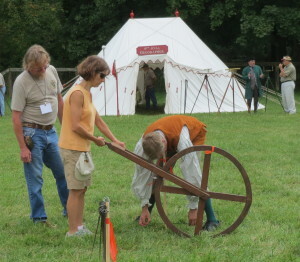 A variety of surveying equipment was on display at the 17th National Rendezvous, an annual event hosted by the Surveyors Historical Society (SHS). 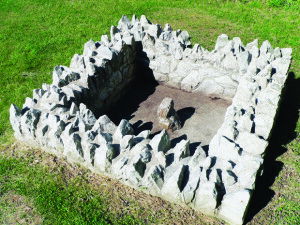 Mary Sue Boyle, a local historian who has researched some of the locals with ties to Mason and Dixon, said one present-day engineer shared his unique reason for attending the festivities with his wife: He proposed to her at the Star Gazers’ Stone. The event also held special significance for Edwin Danson of England, the author of Drawing the Line: How Mason and Dixon Surveyed the Most Famous Border in America. Danson said he was delighted to be able to meet Kate “Tolly” Roby, the owner of Harlan House, with whom he had exchanged numerous emails during the writing of the book. His other thrill: “going in the house,” where Roby was graciously conducting tours. One of the highlights of the day’s activities for everyone was a new plaque and stone dedication, the result of work done by Todd Babcock, the chairman of the Mason and Dixon Line Preservation Partnership. Babcock, who set up modern surveying equipment in 2005 to retrace Mason and Dixon’s work, determined that their actual “star-gazing point” in 1764 was hundreds of feet south of the Star Gazers’ Stone. Harlan House, a private residence where Mason and Dixon stayed when they made surveying history, still stands in Newlin Township. The newly discovered location presented a challenge in placing a historic marker since it’s covered by the pavement of Stargazer Road. 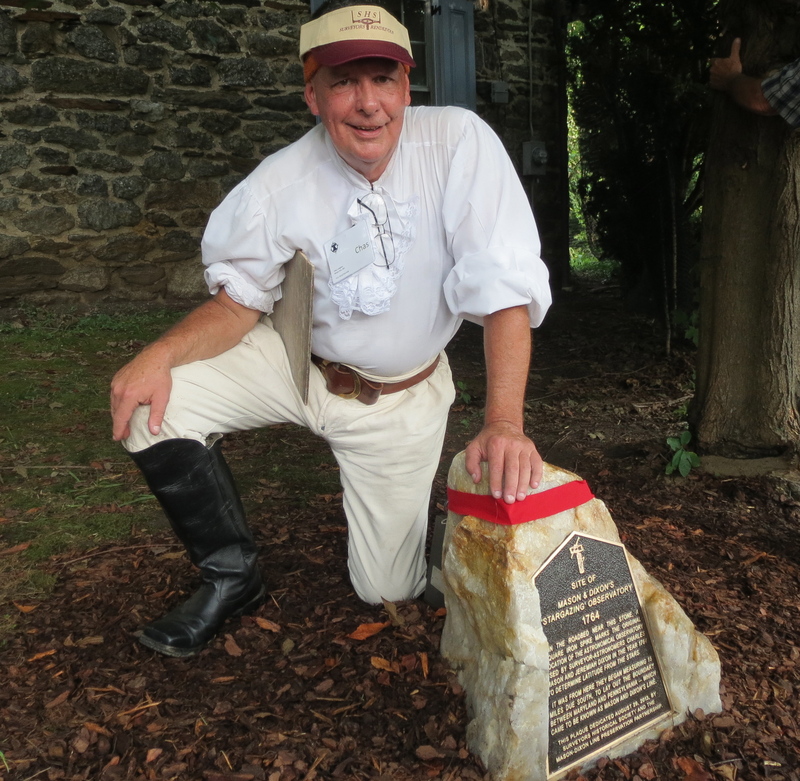 The solution was to place a commemorative plaque – anchored by about 540 pounds of the same Setters quartz of the Star Gazers’ Stone – about 20 feet away on Roby’s property and to drive a square iron spike into the roadbed: easier said than done. It took more than 50 whacks by dozens of people to level the spike. “This is almost like the strong man contest at the carnival,” joked Chas Langelan, vice chairman of SHS and one of the event organizers, as people took turns demonstrating their hammering prowess – or lack of it. Discussing the crowd that had gathered, Laura Cooper’s eyes widened when told that visitors had traveled from halfway around the globe to her neighborhood. “That’s crazy,” she exclaimed. There was a mistake in Ms. Shea’s article where she said: “She credited Kaat with approaching the township when the land that contains the Star Gazers’ Stone, a reference point for Mason and Dixon listed on the National Register of Historic Places, went up for sale. It is now permanently protected.” This was not a comment that was made by the Newlin Supervisor. Perhaps someone else said something like that but the 5 acres purchased by Newlin with grant monies is the property adjacent to the property containing the stone. The stone is on property belonging to Natural Lands Trust. Newlin Township Supervisors’ Chair Janie Baird said she was pleased the site is finally getting the recognition it deserves. 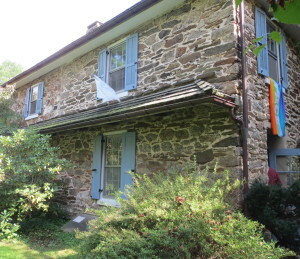 She credited Kaat with approaching the township when the land that contains the Star Gazers’ Stone, a reference point for Mason and Dixon listed on the National Register of Historic Places, went up for sale. It is now permanently protected. This is not a true conveyance of facts. The land that contains the Stargazers Stone is NOT what was up for sale. The land that contains the Stargazers Stone was permanently protected decades earlier by Chester County with easements providing access to and around the Stone from Township property. The 5 acres that Newlin helped to purchase more recently with State /County grant monies and Township monies at $51k per acre (after the hardly developable parcel was for sale for about 7 years prior) is the wooded land to the north of The Stone that has NO connection physically to The Stone nor does it have any part of The Stargazers Stone on it. You are correct that the parcel of land that the Stargazers Stone sits on was protected by Chester County many years earlier, but the 5 acre tract does have a significant connection to the stone and the story of boundary dispute between Pennsylvania and Maryland. 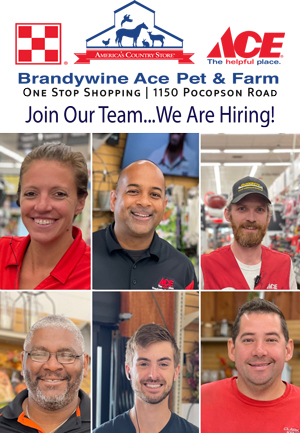 We have found that the Latitude of the Southernmost Point of Philadelphia, from which the entire boundary between PA and MD is based, actually falls on the 5-acre tract. Eventually, we hope to add further interpretation to the story and we may mark the position of the latitude of the north end of the 15-mile line which falls on the property so there is most certainly a connection. There is even a possibility that Mason and Dixon set a stone or marker there. As far as the property being developable – I’ve been a surveyor working in the building and construction industry for 30 years and I’ve seen houses built on much more difficult sites. It would take me only a few hours to work up a design for a driveway with a house and complete a grading plan. Part of the reason the property was for sale for 7 years is due to the fact that we have been in a housing recession for over 5 years. Eventually, a builder would have come along and another house would have been built, the viewscape would have been scarred and another piece of history would have been lost.